I recently had one of the most powerful learning experience of my professional career. It came as I was piloting an integrated science/literacy project with a group of sixth graders in inner-city Oakland, CA. This Earth Science unit was designed to help students learn about climate change. For six weeks, students explored science content using a range of disciplinary literacy strategies such as annotating text, analyzing evidence based arguments, and writing evidence-based explanations. The first four weeks of the unit was teacher guided and involved students in reading articles, examining trends in graphs, working with animations/simulations, and discussing new understandings in pairs and small groups. Drawing on the notion that deep, engaged learning occurs when students explore self-selected, open-ended questions about which they are genuinely interested, the last two weeks of the unit involved students in completing an inquiry project. This project challenged the students to build on what they had learned during the first part of the unit and take it further by designing a tool, technique, or campaign to combat climate change. Each group chose a focus (from a bank of five choices), conducted online research, and went about inventing a way to lessen the effects of climate change. The design challenge Google site spells out the project parameters and the assignment guidelines. To help scaffold students’ inquiry as they gathered information online, I opted to try out the free service Google offers for building a customized search engine (see http://www.google.com/educators/p_cse.html). The customized search engine limits the Web sites that come up in search results, listing only those that are pre-selected by the designer/teacher. Given the sheer volume of information on the Internet,creating a customized search can be highly supportive option for novice Internet users. Since a teacher can choose the sites she wants students to search, she can guarantee students’ searches will yield limited number of highly relevant search results, making the time learners spend online more efficient and purposeful. The advantages of narrowing searches to a more targeted and manageable size ensures that students gain valuable practice sifting through a limited amount of search results, freeing up time to put the information to use. Having explored the use of a customized search engine, I can attest to its efficacy as a viable scaffold for online research. I observed even the most novice Internet users successfully locate relevant, reliable information in a short amount of time. I was elated to see students spend quality time digging into the resources they found, following the links to related sites, and making a range of inter-textual connections to content within and beyond the unit. To set up a customized search engine, simply set up a Google educator account, choose the Web sites and resources you would like students to access, then follow a few simple steps to create the search engine. 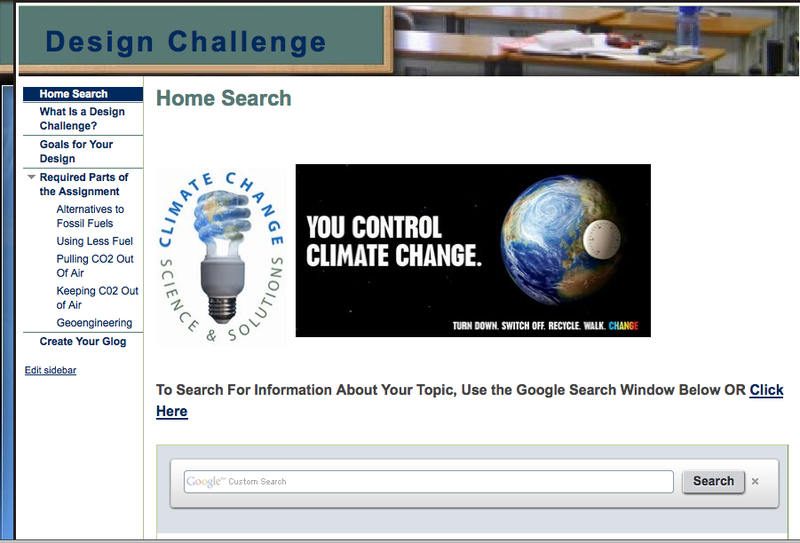 An example customized for sixth graders studying ways society can lessen the effects of climate change can be found at Combating Climate Change http://www.google.com/cse/home?cx=014465768746147993326:rncbgcerhjk&hl=en.